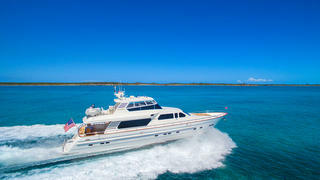 The 25 metre motor yacht Carol Ann has been listed for sale by Barry Flanigan at Bradford Marine Yacht Sales. Built in GRP by Taiwanese yard Horizon Yachts to a design by Tommaso Spadolini, Carol Ann was delivered in 2001 as a Horizon 82 model. A flamboyant interior in high gloss cherry wood contrasted with richly textured fabrics accommodates six guests in three cabins. These consist of a full beam master suite, VIP suite and a twin cabin, all with entertainment centres, television screens and marble en suite bathroom facilities. In addition, there are quarters for four crew aboard this yacht for sale. The spacious main saloon has an L-shaped settee to starboard along with custom cherry wood cabinetry and a wide wet bar that retracts when not in use. On the port side is a sophisticated entertainment centre including a 42 inch plasma television screen on an electric rise and fall mechanism and a Dolby digital stereo surround sound system. Forward, the galley has all-new appliances in an open configuration including a U-shaped settee around a dining table facing a slimline LCD television screen mounted under the overhead galley cabinets. The full beam aft deck is ideal for al fresco entertaining and dining, offering built in upholstered seating, a large dining table, full wet bar and port and starboard stairs down to the swim platform. Forward on the flybidge are two Stidd helm chairs a built-in banquette seating six guests, a wet bar, fridge, ice maker and a gas infra-red grill. The entire area can be enclosed and air conditioned. Twin 1,400hp Caterpilllar diesel engines give her a cruising speed of 22 knots topping out at 25 knots. Lying in Fort Lauderdale, Florida, Carol Ann is asking $1,400,000.